Apparently, 20 years is a long time. It doesn’t feel it. It feels like a motorway movie of the glorious British landscape in all its shapes and seasons, with giant memory-screens flashing up images of fairytale theatres and grotty lovely theatres. Of medieval halls and Turner Prize winning venues. Of palmas, singing and dancing in the aisle of the OAP mobility bus (with lift) which used to trundle us about – there was almost as much music on the bus as on stage. Of the human chain which carried our amps and monitors upstairs to storage at the end of the night. Of getting lost in corridors, and climbing ladders and through trapdoors to glowing control rooms or rope-hung fly-floors. Of hundreds of rhythmic feet, fingers and voices each telling a new story, and performers and audiences becoming one emotional animal, soaring on the moment. And of comet Hale Bopp smiling down on us changing a wheel on the M4 outside Swindon. What good did we do? Apart from any benefit to the audiences and artists, every one of our hundreds of shows kept one theatre lit and its staff employed for one more night. And many of our audiences finished the evening in a local bar or restaurant, and hired a taxi home, thereby generating even more prosperity and harmony. Every company should remind themselves of this contribution by the arts. 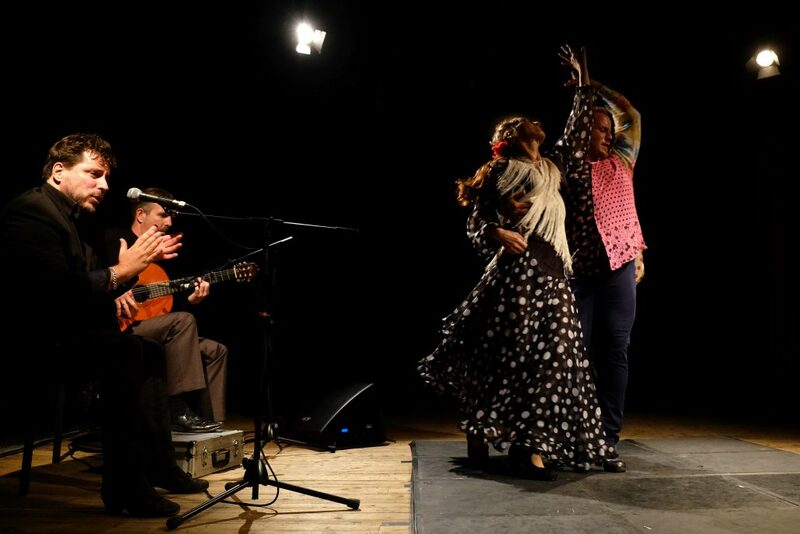 The closure of a tube station and a bicycle collision may not seem to be essential to the formation of a flamenco company, but they played a big part. Without the closure, the club we ran at the time – Club Azul – would probably have kept on ticking over, and we wouldn’t have been pushed to become a touring band. Without the collision we wouldn’t have had the compensation money to buy the computer equipment needed to run the company at all. It’s not very romantic or spiritual, but Flamenco Express was made possible by a Mac 840AV with 16 megbytes of RAM running Photoshop, Pagemaker and Apple Works. Plus a scanner and printer. Suerte or what? Our first legally-worded performance contract was a copy of one for the singer Joe Brown, which we found in the dressing room of the lovely Roses Theatre, Tewkesbury. Naturally other, less random factors played their part. Like the sheer talent available in London at the time, and the new British market for flamenco in the post-Joaquin Cortes era. Touring then was relatively simple. Many venues were local-authority sponsored, and appreciated the diversity we added to their programming. 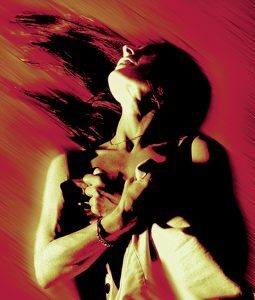 Our approach was (and still is) to demystify flamenco to British audiences by publicising it as a european version of the Blues (which it surely is). Venues were prepared to offer a guaranteed fee, even to a new company like us. And audiences were very encouraging. Inevitably, Japanese money came calling and the original company had to change personnel, which has become the way we work. Since the original regular company of La Joaquina, Chris Clavo, Paco Peréz, Manuel de la Malena, Tito Heredia and Gemma de la Cruz, we have hosted over 40 artists in almost 200 venues, and each of the One Thousand and Some Nights night has been different. 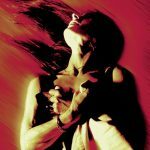 The result is that we have probably presented a wider range of flamenco talent to a wider range of British audiences than any other company. A sort of full-time floating festival. This wasn’t an “artistic policy”, it just grew out of necessity. The best way to keep a company touring – and to have fun – was to have a succession of guest artists and allow them total artistic freedom. The shows have consequently relied more on spontaneity and improvisation than lengthy rehearsal and choreography, which we simply cannot afford. A bit scary, but very exciting. It’s a formula which seems to appeal to British audiences, and to the artists eager to entertain them. Artists fly in a day or two before the show, have a run-through in the studio, then perform the next day or that evening. Any more preparation would simply be uneconomical. And even counter-productive on stage. We also feel that it is important to respect the physical needs of singers. They are not machines. The other secret is that we pay artists money. Spain has been hit hard by the economic climate, and more highly-respected artists than ever have to look abroad for work. Britain is lucky that many of them are able to travel and work here. It hasn’t been difficult to persuade artists to share the sweaty backstage tensions and fears, and to feel the glittering anticipation of the audience in the dark and the blazing technicolour fury of the company at full steam on stage. It is what they live for. Our 10th Anniversary at Hackney Empire with La Tati springs to mind. But there have been many. This year’s guests include Alejandro Molinero, Manuel Reyes Maya, La Nati, Victor Fernández , Emilio Ochando, Paco Peréz, Pedro Sanz and Antonio el Pola. Everyone has been a stimulating privilege and pleasure to work with. More new guests are in the pipeline for next year, and the year after..